You will be given a Free reference e-book to read which has 768 pages And the test will be based on that e-book. A CCIE (Cisco Certified Internetwork Expert ) in routing and switching certification works in certifying the knowledge and skills needed by a network engineer when it comes to planning, operating and troubleshooting the converged and somewhat complex infrastructure of networks. While a candidate for this certification is not required to formally pass and meet certain prerequisites, note that you will still need to pass a written certification and qualification exam to be certified. The written exam is usually followed by a hands-on laboratory exam. In order for you to easily pass the exam, you should have in-depth knowledge about all the topics linked to CCIE routing and switching. Among the many things that you should consider learning to increase your chances of passing the exam are the basics of troubleshooting and configuring even the most complex converged networks, configuring and troubleshooting advanced technologies as a means of effectively supporting the networks of your service provider and configuring and troubleshooting the storage area networks over various interfaces. The good thing about deciding to be a Cisco certified internetwork expert in routing and switching is that you can now easily master the field with the help of the free CCIE routing and switching practice course available at Brainmeasures. It would be easier for you to master all aspects of this field with the presence of the free study guide which forms part of the course as well as its highly accurate practice test. This can help you in preparing yourself on what might take place when taking the exam. If working as a CCIE routing and switching professional is one of your major aims, then the free CCIE routing and switching certification practice course can supply you with the level of knowledge that you wish to attain from it. This popular practice course free takes pride of its free study guide which is filled with all the information that you need to become a certified expert in routing and switching networks. It highlights even the most complex issues and aspects linked to the field so receiving the right level of enlightenment which is helpful in passing the actual exam is a great possibility. You can also expect the provided free CCIE routing and switching practice test to help you in mastering the actual examination environment. With this, you can develop a good plan which will enable you to get a passing rate when taking the certification. How to effectively operate Cisco equipment? 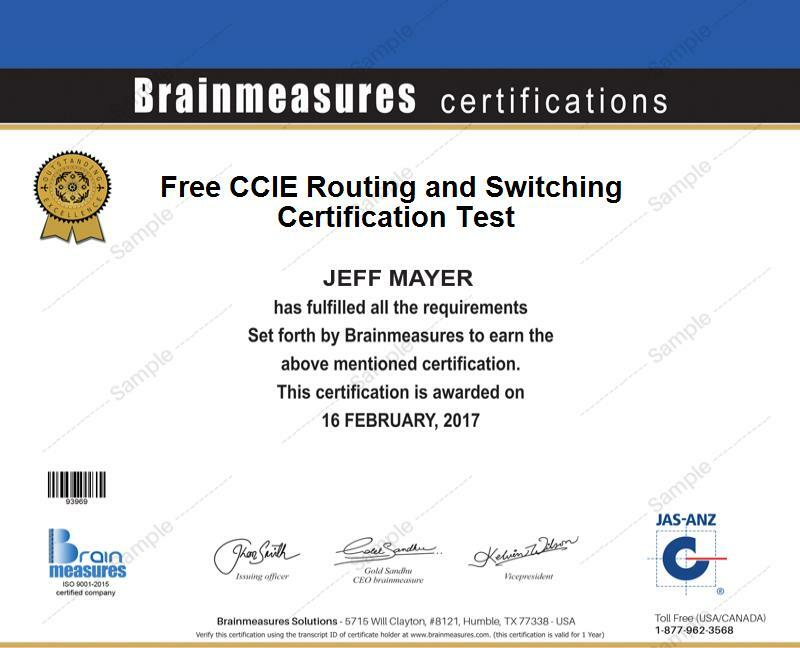 All of those who wish of easily pass the CCIE routing and switching certification exam can enrol in the free CCIE routing and switching practice course introduced by Brainmeasures. It aims to offer more help to network designers, engineers, architects, developers, programmers and all other professionals who wish to acquire a CCIE routing and switching certificate and improve their knowledge and expertise in the field. Upon receiving your CCIE routing and switching certification, you can also start to increase your chances of earning higher. It lets you work as a Cisco certified internetwork expert and earn an annual salary within the range of $64,000 to $114,000. The presence of your certificate also lets you work as a routing and switching network engineer and receive approximately $87,000 to $159,000 every year.